Larkin was born October 28, 1850, in Chester, Delaware County, Pennsylvania. 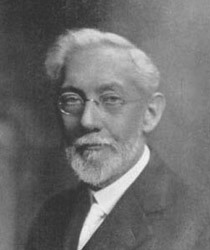 Clarence Larkin was an American Baptist pastor, Bible teacher, and writer. Larkin was converted to Christ at the age of 19 and then felt called to the Gospel ministry. The Clarence Larkin Books and Clarence Larkin Charts have been extremely helpful resources for Christians since they were first published. 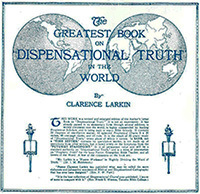 We are making some of the Clarence Larkin Charts available here free, to aid you in your Bible studies. Fundamental Christianity is not divided as much on the FACT OF HIS COMING as the TIME (as related to other events) OF HIS COMING. Sometimes, without "Rightly dividing the word of Truth," confusion may appear. Don't lull yourself into complacency with the idea "We can't know." If you don't know the signs which Jesus gave, whereby you could know the season, it's your own fault. Jesus commended the Pharisees for being able to "discern the sign of weather change. Check back later for "revelation,prophecy,end-times,timeline,charts,daniel,revelation,rightly dividing the word, second coming ,spirit world, two comings, antichrist, tribulation, rapture, prophecy and 666. Based on the drawings of Clarence Larkin by Rev. C.C. Gosey. This bible chart has been used by prophecy teachers for many years. Thousands upon thousands of Doc Gosey's books and charts have been printed and read around the world. These living classics continue to be a blessing to all who use them as teaching and study tools.